There is a selection of small but critical items that deserve a place in almost every pack. You won't use every one of these items on every trip, but they can be lifesavers in an emergency, insurance against the unexpected. Exactly how much "insurance" you should carry is a matter of debate. Some respected minimalists argue that weighing down your pack with insurance items causes you to climb slower, making it more likely you'll get caught by a storm or nightfall and be forced to bivouac. "Don't carry bivy gear unless you plan to bivy," they argue. The majority of climbers, however, take along carefully selected safety items to survive the unexpected. They sacrifice some speed but argue they will always be around tomorrow to attempt again what they failed to climb today. Other critical items often join the list of essential equipment, depending on the trip. We will take a look at the Ten Essentials and at a number of these additional items in the sections that follow. 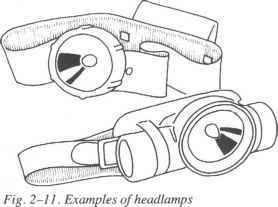 Headlamps (fig. 2-11) and hand-held flashlights are important enough and temperamental enough to make it worthwhile to invest in only quality equipment. Waterproof flashlights are worth the added expense. They function reliably in all weather, and the contacts or batteries won't corrode even if stored in a moist garage for months. Few headlamps are waterproof, but some are more water-resistant than others. If you decide that a truly waterproof headlamp is important, start by buying a small waterproof flashlight. Sew a wide length of elastic into a headband, then sew several small retaining loops of thinner elastic onto the headband to hold the flashlight in place. The flashlight will be held on the side of your head, much like a pencil resting on top of your ear. All lights need durable switches that cannot turn on accidentally in the pack, a common and potentially serious problem. Switches tucked away in a recessed cavity are excellent. So are rotating switches in which the body of the flashlight must be twisted a half turn. If it looks like your light switch could be tripped accidentally, guard against this danger by taping the switch closed or removing the bulb or reversing the batteries. Adjustable focus is an excellent feature available on some lights. The reflector rotates so that the lamp gives flood lighting for chores close at hand or spot lighting for viewing objects far away. Adjustable focus permits maximum use of your light, often letting you see farther and accomplish more than a brighter light lacking this feature. Flashlight bulbs don't last long, so carry spare bulbs in addition to spare batteries. You don't have to stick with the bulb that comes with your light. If it's a vacuum bulb, you can get a brighter beam with a replacement bulb filled with a gas, such as halogen, krypton, or xenon. These gases allow filaments to burn hotter and brighter than in vacuum bulbs, though they also draw more current (amperage) and shorten battery life. Most bulbs have their amperage requirement marked on the base. You can get a rough idea of battery life by dividing the bulb's amperage figure into the amp/hours assigned to the batteries. For example, batteries rated at 4 amp/hours will burn about 8 hours with a .5-amp bulb. It's a good idea to carry bulbs drawing different amperages. Conserve batteries by using low-amperage bulbs for tasks around camp. Switch over to high-amperage bulbs when you need a brighter beam. Alkaline batteries are the best general-purpose batteries commonly available at mass merchandisers. They pack more energy than cheaper lead-zinc batteries. The major problems with alkalines are that voltage (hence brightness) drops significantly as they discharge, they can't be recharged, and their life is drastically shortened by cold temperatures (they operate at only 10 to 20 percent efficiency at 0 degrees Fahrenheit). Nickel-cadmium batteries (nicads) can be recharged up to a thousand times, maintain their voltage and brightness throughout most of their discharge, and function well in the cold (about 70 percent efficient at 0 degrees Fahrenheit). However, they don't store as much energy as alkalines. For climbing, look for high-capacity nicads, which pack two to three times the charge of standard nicads and are worth the added expense. Lithium batteries have twice the voltage of regular batteries, so you'll need to rewire your light to run off half as many batteries. But one lithium cell packs more than twice the amp/hours of two alkalines. The voltage remains almost constant over the life of a lithium battery, and its efficiency at 0 degrees Fahrenheit is nearly the same as at room temperature. They are expensive. A one-day supply of extra food is a reasonable emergency stockpile in case you are delayed by foul weather, faulty navigation, injury, or other reasons. The food should require no cooking, be lightweight and easily digestible, and store well for long periods. A combination of jerky, nuts, candy, granola, and dried fruit works well. Some climbers also bring extra cocoa, dried soup, and tea if a heat source is available. How much extra insulation is necessary for an emergency? The garments used during the active portion of a climb and considered to be your basic climbing outfit are the inner and outer socks, boots, underwear, trousers, shirt, sweater or pile coat, hat, mitts or gloves, and raingear. These garments suffice over a wide range of temperatures and weather if the climber is active. Extra clothes for an unplanned bivouac are added to these basics according to the season. Ask yourself this question: what do I need to survive the worst conditions I could realistically encounter? Extra underwear is a valuable addition that weighs little. During a strenuous climb, perspiration can soak the next-to-skin layer and conduct heat away from the core. It is important to get rid of wet garments in contact with the skin before donning thicker insulation, such as down or synthetic coats and an outer shell. Protection for the neck and head can be gained by using long underwear with a zippered turtleneck, and a balaclava. An additional thick hat will retain almost as much warmth as an additional sweater. For the feet, bring an extra pair of heavy socks; for the hands, an extra pair of polyester or pile mitts. For winter and expedition climbing in severe conditions, you'll need more insulation for the torso as well as insulated overpants for the legs. In addition to your rain shell, carry some sort of extra shelter from the rain, such as a plastic tube tent, a Mylar "space blanket" taped into the shape of a bivy sack, or plastic trash-can liners. Carry an en-solite seat pad to reduce heat loss to the snow (some packs can double for this purpose). Some climbers carry a bivouac sack, weighing about a pound, as part of their survival gear and go a little lighter on their insulating layers. It's a good strategy. 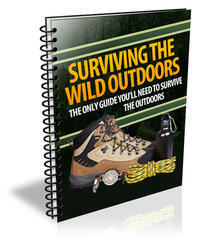 (Chapter 3 has details on bivouacs and bivy sacks.) The sack protects your insulation from foul weather, minimizes the effects of convection by quieting the air surrounding you, and traps much of the heat escaping from your body so that the temperature of your cocoon rises. Eyes are particularly vulnerable to the brilliance of mountain skies, visible light reflecting off snow, and ultraviolet rays—which at 10,000 feet are 50 percent greater than at sea level. The retinas of unprotected eyes can be easily burned, causing the excruciatingly painful condition known as snow-blindness. Because damage occurs to the eyes before discomfort is felt, it is essential to wear sunglasses to reduce the visible light and invisible ultraviolet rays. Don't let cloudy conditions fool you into leaving your eyes unprotected. Ultraviolet rays penetrate clouds, and the glare of reflected light can cause headaches. Sunglasses should filter 95 to 100 percent of the ultraviolet light. They should also be tinted so that only a fraction of the ambient light is transmitted through the lens to your eyes. For glacier glasses you want a lens with a 5 to 10 percent transmission rate. For more general outdoor use, the lenses should have about a 20 percent transmission rate. Look in a mirror when trying on sunglasses: if you can easily see your eyes, the lenses are too light. Lens tints should be gray or green if you want the truest color, and yellow if you want visibility in overcast or foggy conditions. There is little proof that infrared rays (heat-car-rying rays) harm the eyes unless you look directly at the sun, but any product that filters out a high percentage of infrared, as most sunglasses do, is added eye insurance. The frames of sunglasses should have side shields that reduce the light reaching your eyes, yet allow adequate ventilation to prevent fogging. Problems with fogging can be reduced by using one of the many anti-fog lens cleaning products that are available. Groups should carry at least one pair of spare sunglasses in case a pair is lost or forgotten. You can also improvise eye protection by cutting small slits in an eye cover made of cardboard or cloth. A climber who depends on corrective lenses should carry a spare pair of glasses. Normal glasses with clip-on sunglasses can function as one pair, and good prescription sunglasses with extra-dark coatings can be the second pair. Alternatively, this climber can carry two normal pairs of prescription glasses plus a well-ventilated pair of ski goggles outfitted with a very dark lens. Many climbers who need corrective lenses prefer using contact lenses instead of glasses. Contacts improve visual acuity, don't slide down your nose, don't get water spots, and allow the use of non-prescription sunglasses. Contacts do have some problems, however. Sun and blowing dust and dirt can dry out or irritate your eyes, though good side shields reduce the ill effects. Back-country conditions make it difficult to clean and maintain the lenses. Don't let a first-aid kit give you a false sense of security. It cures very few ills. Doctors say that in the field there is often little they can do for a serious injury or affliction except initiate basic stabilizing procedures and evacuate the patient. The best course of action is to take the steps necessary to avoid injury or sickness in the first place. Still, you want to be prepared for the unexpected. The contents of your kit will be items you carry on all trips: Band-Aids or other small adhesive bandages, moleskin, adhesive tape, cleansers, soap, butterfly bandages, scissors, triangular bandages, a Carlisle bandage, roller gauze, and gauze pads in various sizes. Carry enough bandages and gauzes to absorb a significant quantity of blood. Severe bleeding wounds are a common back-country injury, and sterile absorbent material cannot be readily improvised. In addition to the basics, consider the length and nature of your trip. If you are traveling on a glacier, for example, tree branches won't be available for improvised splints, so a wire ladder splint would be extremely valuable in the event of a fracture. For a climbing expedition, you may need to consider appropriate prescription medicines. Knives are so essential for food preparation, fire building, first aid, and even rock climbing that every climber needs to carry one. The knife should have two folding blades, a can opener, a combination screwdriver and bottle opener, scissors, and an awl. The tools and the inside of the casing should be made of stainless steel. Although you may carry a few additional tools on certain trips, the knife is your basic tool kit. A cord attached to the knife and secured to your belt lets you keep the knife in your pocket for ready access without danger of losing it. An emergency supply of matches, stored in a watertight container, should be carried on every trip in addition to the matches or butane lighter used routinely. Storing waterproof or wooden matches and a strip of sandpaper in a film canister makes a good emergency system. Fire starters are indispensable for igniting wet wood or starting a fire quickly in an emergency. 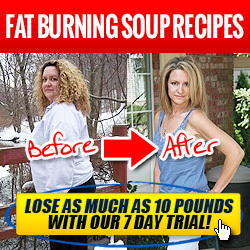 They can even be used to warm a cup of water or soup, if you have a metal cup to heat it in. Common fire starters are candles or solid chemical fuel (such as heat tabs or canned heat). High peaks are often bone dry or frozen solid, so you usually carry the water that is needed to prevent dehydration and maintain energy. A single 1-quart bottle usually suffices, but if it's hot and you sweat a lot, you may need to carry two. Wide-mouthed polyethylene bottles are the most popular because they can be easily refilled with snow or water, and they impart no flavor to the water, unlike aluminum. If you do use an aluminum bottle, be careful not to mix up the water bottle with the bottle that carries fuel for the stove. Giardiasis, a waterborae bacterial infection, is a major health concern for alpine travelers. The cyst of the bacteria has tainted many water sources in the wilds, and it takes only one swallow of contaminated water to get sick. The illness takes six to twenty days to manifest itself, with symptoms that include nausea, flatulence, diarrhea, cramps, belching, fever, and dehydration. Several methods of water purification make water safe to drink by killing or filtering out Giar-dia lamblia and other contaminants. Chemical treatment with tablets of iodine or halazone is effective, and tetraglycine hydroperidide (TGHP) tablets are better yet. Follow directions closely. The required amount of chemical and soaking time increases dramatically with colder water. If you fill your bottle from a glacial stream, you may need to place the bottle in the sun or inside your shirt to raise the water's temperature. Bringing water to a rolling boil will kill Giardia cysts but may not kill other disease-causing bacteria and viruses unless the water boils for nearly 20 minutes. A combination of chemical treatment and a short boil makes water safe. Water filters are another option. Filters with a pump can strain a quart of water in minutes and do not impart any unpleasant taste to the water. A good water-filtering device provides a method to clean and extend the life of the filter, which is replaceable. Buy only filters with pore sizes smaller than 4/10 micron (.4 micron) to ensure you will filter out Giardia cysts, flukes, tapeworms, and protozoa. Sunlight at high altitudes has a burning capacity many times greater than at sea level, so much so that it is a threat to both comfort and health. Climbers cannot avoid long exposure to the sun so they must reduce the burning ultraviolet rays reaching their bodies by covering their skin with clothing or burn-preventing creams (sunscreens). Individuals vary widely in natural pigmentation and the amount of protection their exposed skin needs. There is only one rule here: the penalty for underestimating the degree of protection needed is so severe, including the possibility of skin cancer, that you should always protect your skin. Clothing is by far the best sun protection and is worth the discomfort it causes on a hot day. Skin not covered by clothing should be covered with sunscreen. Most sunscreens use p-amino benzoic acid (PABA), but if your skin is sensitive to PABA there are other chemicals that yield the same sun protection factor (SPF) as PABA creams. For glacier travel or a snowy environment, get a sunscreen with an SPF of 15 or more. Cover all exposed skin, even if it's shaded, because reflected light can burn the underside of your chin and nose and the insides of your ears. Some sunscreens are advertised as waterproof and will protect you longer than regular products when you are sweating heavily. Regardless of the sunscreen used, reapply it occasionally if you are perspiring. oxide pastes ensure complete protection, and the grease bases keep them from washing off. One application lasts the entire climb, except where fingers or equipment rub the skin bare. The disadvantages of these creams is that they are messy and so difficult to remove that you may need help from a cold-cream cleanser. The area around the mouth is particularly susceptible to fever blisters caused by sun exposure. The lips should be covered with a total-blocking cream that resists washing, sweating, and licking. Zinc oxide and lip balms containing PABA are both good. Reapply lip protection frequently. The wilderness is an occasional home for people but the permanent habitat of insects. Some of them—mosquitoes, biting Hies, "no-see-um" gnats, ticks, chiggers—want to feast on your body. You can protect your body and blood with heavy clothing, including gloves and head nets in really buggy areas. In hot weather, covering your body with heavy clothing may be unbearable, and insect repellents become a good alternative. Repellents with N,N-diethyl-metatoluamide (DEET) claim to be effective against all these insects, but are really best for keeping mosquitoes at bay. One application of a repellent with a high concentration of DEET will keep mosquitoes from biting for several hours, though they will still hover about. Mosquito repellents are marketed under many names, have differing potencies, and come in liquid, cream, spray, and stick form. Be aware that DEET can discolor or dissolve plastics, paints, and synthetic fabrics. Despite claims by manufacturers, DEET is not very effective at repelling biting flies. Products with ethyl-hexanediol and dimethyl phthalate are much more effective against black flies, deer flies, and gnats. Unfortunately fly repellents don't do much to ward off mosquitoes. Ticks are a potential health hazard due to the diseases they can carry, such as Lyme disease and Rocky Mountain spotted fever. In tick country, check clothing and hair frequently during the day. At night, give your clothes and body a thorough inspection to locate ticks before they embed themselves. If you find a tick on your body, cover it with heavy oil (mineral, salad, etc.) to close its breathing pores. The tick may disengage at once. If not, allow the oil to remain in place for half an hour, then carefully remove the tick with tweezers, taking care to remove all body parts. Once a tick is deeply embedded, you may need a physician to remove its buried head. It's helpful to carry an emergency repair kit for your equipment. It could include wire, tape, safety pins, thread, needles, yarn, string, patches, and small pliers. This kit will probably grow over time as you add items you wished were along on a previous trip.